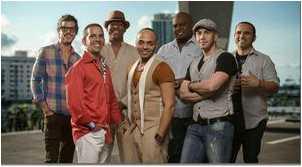 The Contemporary Cuban Music Festival is an exciting concert presentation featuring 7 time GRAMMY nominee, composer-pianist-bandleader-entertainer OMAR SOSA and his QUARTETO AFRO CUBANO, and 3 time GRAMMY nominee, the dynamic Latin dance group TIEMPO LIBRE. One of the most versatile musicians today, OMAR SOSA has championed the World-Jazz movement for over 2 decades, fusing Afro Cuban, African Pop, folk, rock and electronica into an all embracing musical concept. His latest project QUARTETO AFROCUBANO features Cuban drummer Ernesto Simpson and Cuban saxophonist Leandro Saint-Hill, along with African bassist Childo Tomas. The Miami-based TIEMPO LIBRE is celebrated for its sophisticated performances of timba music, an irresistible, dance-inducing mix of R&B, pop, jazz, and Cuban son. They have introduced Cuban music to new audiences through appearances on shows such as the Tonight Show, Live from Lincoln Center, and Dancing With the Stars, in addition to performing with leading orchestras and at festivals throughout the world. In addition to concert presentations, both groups offer master class activities. “Sosa is one of the truly illuminated minds of world jazz. He is shaping a new synthesis of Latin and American jazz.” – Billboard Magazine. “Tiempo Libre, the Cuban expatriate band from Miami.. skillfully kept them gyrating until the evening’s end with satisfying Afro-Cuban party grooves sometimes derived from erudite sources… like J. S. Bach.” – Variety Magazine.